New Delhi: Despite the Union government saying that the country’s consumer protection Act cannot be amended to include services such as drinking water supply and waste disposal—typically provided by urban municipalities—a parliamentary panel that suggested this is sticking to its guns. The ministry of consumer affairs has said it is not considering the proposal due to “administrative and financial implications", as well as opposition from states and Union territories (UTs). The Parliamentary Standing Committee on Food, Consumer Affairs and Public Distribution has asked the ministry to give its recommendation a “re-thought, keeping in view the right of a consumer to good living". The quality of services provided by municipalities is a touchy subject in India’s cities where planning still revolve around reaching the maximum number of people rather than the quality of services offered. The Consumer Protection Act, 1986, aims to promote and protect the rights and interests of consumers. Municipal services are currently not covered under this law. The parliamentary grouping had recommended all mandatory municipal services, such as water supply, be included in the Act to ensure better services to consumers. “One of the major problem areas has been deficiencies on the part of municipalities in providing services which are mandatory in nature. However, the proposal…was deferred…as service providers expressed their inability to provide expected standards," the committee report had said. “This is something that will have to be examined. There are various implications to such a move (to include essential services in the Act)," said urban development secretary M. Ramachandran. He said the urban development ministry has written to the states asking them to benchmark certain services such as drinking water, solid waste management and sewage disposal. “But (in the) long term, I think it should be done," he said. Ramachandran administers a Rs50,000 crore urban development programme covering 63 cities across the country. Under the Jawaharlal Nehru National Urban Renewal Mission (JNNURM), the Union government provides grants of between 35% and 90% of the cost of approved projects, depending on the size of the city, with state and local governments, or private investors, contributing the rest. Urban experts, however, say that while the panel’s recommendations indicated a move to higher standards, citizens could not be classified as mere consumers of urban services since they have to play active roles in the service delivery process. “A citizen is a participant in the service delivery as well," said Ramesh Ramanathan, a national technical advisor to JNNURM and an urban issues expert. Ramanathan also writes a column for Mint. “Take door-to-door garbage disposal for example. You can’t have good solid waste management without citizens segregating their garbage at home. And it extends to other areas such as paying user charges on time as well. I am uncomfortable with any move calling citizens mere consumers." JNNURM calls for a disclosure law that mandates municipalities or urban local bodies to reveal their service delivery levels for water, solid waste management, sewerage and storm water drainage. The ministry is also working on creating a benchmark for public transport. Currently, municipalities or water supply utilities express service in terms of the number of litres provided per day, said Ramanathan. However, these are often inaccurate because they do not measure supply at households, he pointed out. 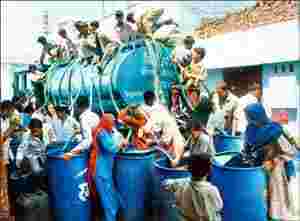 “They (the Delhi Jal Board) measure how much water is flowing into the city and divide it by the population. But there are huge variations in different areas," Ramanathan said. The new benchmarks, called SSLBs, or standardized service level benchmarks, will measure data based on a set of indicators at each municipal wa-rd. For example, in water services, delivery standards will be measured through several indicators such as water pressure, water quality and hours of service, Ramanathan said. Most users of municipal services, however, prefer to go to a lower or higher court in case of complaints, according to lawyers. “Users have different responses to different sorts of complaints. In case of such services, citizens can use RTI (Right to Information Act) to get information and then go to courts," said a senior lawyer, who didn’t wish to be named. He explained that unlike deficiencies in goods, those aggrieved due to deficiencies in essential services don’t look for financial damages but redressal of the complaint, which they expect a court to deliver.